“Ho-Hum” Becomes “Sensational” With Decorative Window Film! By any measure, the largest part of our business at Solar-X of Sarasota is the window film business – that is both “sun control” film and “safety and security” film. But a rapidly growing segment of our business is the sale and installation of decorative films – embossed, textured, patterned and frosted products that add a whole new dimension to the appearance of ordinary windows, doors, and mirrors. These products can be used for both residential and commercial applications, and we are happy to show you any of the hundreds of films available! Homeowners love the appearance upgrade on shower doors, front entries that need privacy from the street, home offices, glass-fronted kitchen cabinets, etc. Businesses appreciate the privacy given to glass-walled conference rooms, partitions between work stations, reception areas, and glass doors into private offices. 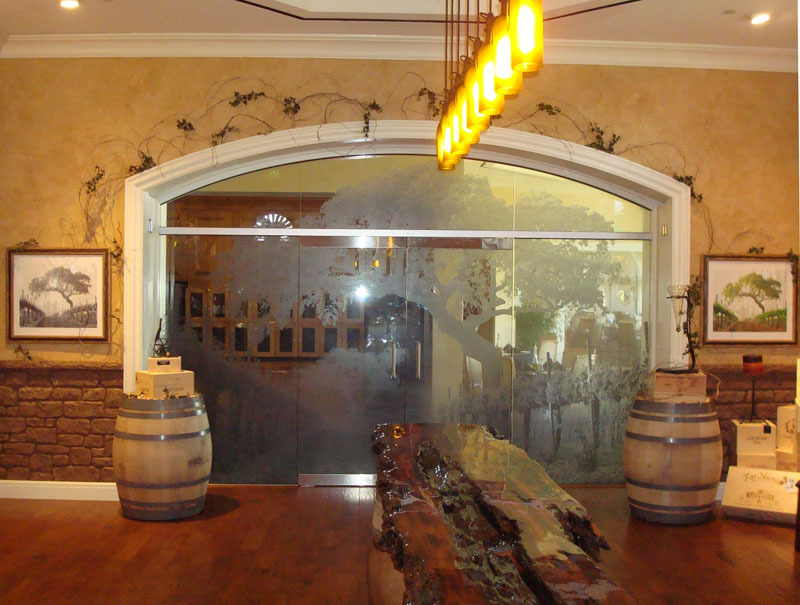 In addition, we can custom fabricate corporate logos, or unique creations that enhance glass appearance and add a “designer touch” – all at a cost that can be less than half the cost of actual etched glass. For large-scale applications, we can provide custom imaging done with solvent printing – a process where actual images can be printed on a clear film “base” and applied to large areas of glass to become a one-of-a-kind mural; or unique design. Or we can install printed “architectural wraps” on storefronts. Today’s printing technology can provide imagery with “high definition” optical clarity, and provide the business owner with a means to promote his or her business that is truly eye-catching! So you have a bathroom with tired, plain shower doors. Or you want privacy for your front door and sidelights. You’ve heard about decorative films for glass, but where do you go to find them? “Big Box” home improvement stores have three or four choices – maybe. Solar-X of Sarasota has hundreds! And we’ll bring them right to your home where you can see them, feel them, and get “in-home” decorating advice for free! Patterns of all kinds; textures like “pebbled glass,” “rain glass,” or “cut glass,” and colors. All at prices that are far more affordable than new, custom decorative glass! Get rid of those dated shear curtains on your front door! Add privacy to a “pool bath” door! Add a “wow factor” to those shower doors in the master bath. Want a peek? Have a look at some virtual samples. Then call Solar-X for a free, no-obligation estimate. We’ll have you “prettied up” just in time for Spring! 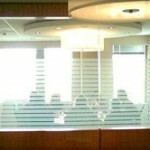 Add privacy to glass between work spaces, on office doors, or open conference rooms. 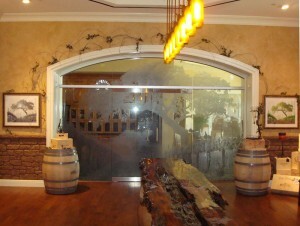 Welcome clients and visitors with custom-crafted, “etched glass”-looking logos on your entry doors. Eye-catching custom glass imaging adds a professional look to office spaces that can’t fail to impress. Solar-X of Sarasota has been serving Bradenton, Sarasota, Venice, and the surrounding area since 1973. Offering the complete line of superior quality SolarGard®, Armorcoat™, and Panorama® window films as well as decorative films, architectural wraps, and custom glass imaging for home and office. Contact us today for a no-obligation consultation and estimate. Greater Sarasota’s Premier Window Film Contractor Since 1973. Solar-X of Sarasota offers full-service consultation, sales, and installation of window film and window tinting services for Bradenton, Sarasota, Venice and surrounding areas; as well as statewide commercial contracting. In business since 1973, we specialize in high quality “sun control;” and “safety and security” window films for residential and commercial clients. In addition, we sell and install decorative films, custom-designed glass imaging for homes and offices, and architectural wraps. Our 38 years of experience allows us to bring a level of knowledge and professionalism not easily found elsewhere in this area, and the craftsmanship of our installation technicians is unrivaled. We are proud to offer our clients SolarGard®, Armorcoat™, and especially Panorama® window film; “ including the awe inspiring “HiLite™” spectrally selective products. We are a certified Panorama® “Premier Plus” warranty dealer; offering the most extensive warranty coverage in the industry, and proud to be the “2008 HiLite Dealer of the Year”, and “2009 Regional Excellence -Southeast” award winners. Whether you are interested in energy conservation, increased comfort, sun control, storm and burglary protection, or protecting your Sarasota area home and possessions from the damage caused by UV rays, Solar-X of Sarasota can address your concerns with the latest technology and highest quality window films. “Cafe 1700″, located inside Sarasota Memorial Hospital has a prime view of what – at least for the next two years – is going to be an unattractive construction site. The distraction and unsightliness of the site created a problem which hospital and cafe management wanted to eliminate in a positive manner for their customers. One suggested solution to the problem was to close the hurricane shutters on the outside of the window. Unappealing at best, no one on staff wanted to do that. A second option was to install an opaque film on the window glass that would keep people from seeing out the window – not only a poor solution but drab and “confining.” Upon making a call to Solar-X however, Hospitality Services Supervisor John Shirk found that there was a third alternative – an eye pleasing “architectural wrap.” Installing a collage of pictures; printed in large format, and “framed” by opaque window film, would give the cafe an eye-catching focal point – not a view of the back side of closed hurricane shutters, or an unattractive construction site! John had been tasked with finding a solution to this problem and was searching for ideas when he approached Solar-X. Excited as he was by the “picture” concept, John thought that the “arty” approach might well be beyond the budget that he had been assigned for the project. But a consultation with Solar-X proved differently. Utilizing a combination of printed material and opaque window film kept the price within range. Now “Cafe 1700″ has a creative solution that is far more pleasing to the eye than just another “ho-hum” approach. If you are a business owner, think how an eye-catching architectural wrap could enhance your storefront. Not only will your business stand out from others to people passing by, or even drivers who see it from the street; it will immediately telegraph to potential customers what you sell, and add a creative flair that will invite people in to browse and buy. Always looking to help their clients with creative applied products, Solar-X of Sarasota would be delighted to help you bring an idea to life for your business – and at a price that fits your budget! Call us today for a no-obligation consultation.